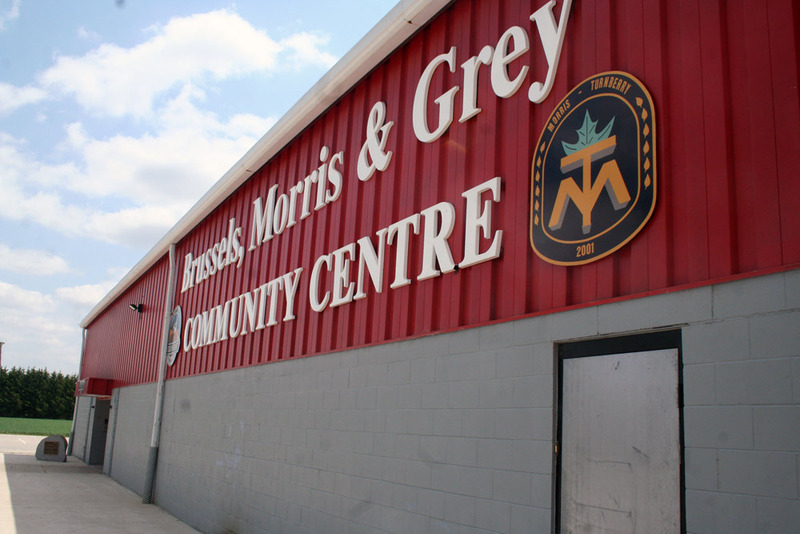 The Brussels, Morris and Grey Community Centre Renovation Committee met for the first time Monday night and they have some grand ideas for the community hub. The members of the committee feel they have a handle on how they want to proceed and will be approaching local designer Chris Blake in the hopes of obtaining new plans for the renovation and expansion of the centre. New plans would include six additional dressing rooms, in addition to retaining the four current dressing rooms. The plans would expand the centre on both the south and east sides, creating a new entrance to the southeast corner of the centre that would completely reconfigure the centre. The entrance would now come in diagonally from the southeast corner to a large lobby and players could walk to the left to access the new dressing rooms, while parents and fans could travel to the right towards the rest of the arena. Members emphasized the importance of having one main entrance to funnel everyone through. However, alleviating traffic and congestion in the lobby so both players and parents can get where they need to go is also crucial to the success of the new arena. The new configuration would also utilize the parking lot to the south side of the arena, which has been underutilized in recent years. There has also been discussion about the creation of a new warm, enclosed viewing area on the west side of the arena. The committee, which is comprised of Huron East Councillor Alvin McLellan, Recreation Board Committee member Melissa Jacklin and citizens Joe Seili, Brett Fischer, Josh Beuermann, Jamie Nicholson, Doug McArter, John van Vliet and Steve Fritz, met at the community centre on Monday night with Fritz absent. Members reviewed plans and began working with a proposal that would add significant space in terms of storage and dressing rooms to the location. While McArter had originally discussed offering up three potential renovation concepts – perhaps a gold, silver and bronze, depending on the cost – committee members decided to “go for the gold” and said they had confidence in the Brussels community and its willingness to rally behind its community centre and a renovation and expansion plan that would bring it into the future. Fischer said the committee couldn’t think about simply patching up some of the known issues at the centre. He said that if the Brussels, Morris and Grey Community Centre wanted to be a player and compete for events and tournaments with other area centres, it couldn’t simply catch up with area arenas, it would have to best them. With the last community centre renovation now 40 years ago, Fischer said that the committee needs to be looking at constructing a building that’s going to serve the community well for the next 40 years. The rest of the committee agreed, saying that if the plans were to spend between $1 million and $1.5 million, the project should be done right. Plans for the centre, created three years ago, to expand the east and south sides and add six dressing rooms and an expanded lobby, totalled nearly $1.5 million. If the committee was to “go for the gold” costs may increase from even those estimates. However, committee members decided that it was best to present one plan they could all get behind to the public. If the public rejects that plan, then they would go back to the drawing board. However, presenting two or three plans could fracture public opinion and members felt it was important to put their best foot forward. Jacklin, however, said that the better the community centre, the better the chance that Brussels could again begin to attract those groups that have slowly bled away over the years like ringette, AAA tournaments and some broomball and girls hockey. She agreed, with Fischer, saying that a “Band-Aid” solution wouldn’t do anything to improve the centre’s reputation in the local hockey community. McArter also discussed the importance of expanding the kitchen at the centre. He said that the more accommodating the kitchen, the more likely that catering businesses will be willing to come and that large events could be held in the auditorium. The group talked about expanding the kitchen into the current lobby with the reconfiguration. Committee members also discussed the need to consult with all of the user groups. With many familiar with both construction and hockey around the table, they acknowledged the need to speak to members of the figure skating club, the curling club, the Brussels Agricultural Society and various service groups that have been known to frequent the centre over the years. Jacklin said it would make sense to reach out to those groups for the next meeting, which has yet to be set, and involve them in the planning process before they get too far down the line. Members also agreed that they should have revamped plans from Blake to bring to the user groups. Then, once everyone has agreed on a strategy going forward, hold another public meeting to keep residents informed on the progress of the project as soon and as frequently as possible. McLellan said that keeping the public informed along the way is paramount to what the committee is doing. Without the support of the public, the project wouldn’t have any impact. The group then toured the community centre, discussing the new plans as well as existing areas that would need to be modernized as part of the renovation. An informal meeting of the fundraising committee has been scheduled for early next month. Members of that committee include Daniel Fritz, Olivia McArter, Deb Seili, Roxanne Nicholson, Mary Bernard and Recreation Committee Chair Nicole Noble.